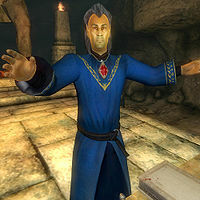 Mankar Camoran is an Altmer mage and the leader of the Mythic Dawn cult, devoted to Mehrunes Dagon, and the primary antagonist of the Main Quest. He may be the illegitimate son of the Camoran Usurper and his Bosmeri mistress (as referenced in the book The Refugees). Mankar is the author of the Commentaries on the Mysterium Xarxes and the creator and leader of the Mythic Dawn. He has two children, Ruma and Raven, who are also members of his cult. When you confront him in Carac Agaialor (his palace) during the Paradise quest, he is wearing the Amulet of Kings with Mankar Camoran's Robe and a pair of gold trimmed shoes. He wields his eponymous staff in combat. Dagon Shrine: Find and infiltrate the Mythic Dawn's shrine. Paradise: Enter Mankar's Paradise, and retrieve the Amulet of Kings. Praise be! The Dragon Throne is empty, and we hold the Amulet of Kings. Praise be to your brothers and sisters. Great shall be their reward in Paradise! Hear now the words of Lord Dagon: "When I walk the earth again, the faithful among you shall receive your reward: to be set above all other mortals forever. As for the rest… the weak shall be winnowed; the timid shall be cast down; the mighty shall tremble at my feet and pray for pardon." Your reward, brothers and sisters: the time of cleansing draws nigh. I go now to Paradise. I shall return with Lord Dagon at the coming of the Dawn! So, the cat's-paw of the Septims arrives at last. You didn't think you could take me unawares, here of all places? In the Paradise that I created? Look now, upon my Paradise, Gaiar Alata, in the old tongue. A vision of the past... and the future. Behold the Savage Garden, where my disciples are tempered for a higher destiny: to rule over Tamriel Reborn. If you are truly the hero of destiny, as I hope, the Garden will not hold you for long. Lift your eyes to Carac Agaialor, my seat at the pinnacle of Paradise. I shall await you there. How little you understand! You cannot stop Lord Dagon. The Principalities have sparkled as gems in the black reaches of Oblivion since the First Morning. Many are their names and the names of their masters: the Coldharbour of Meridia, Peryite's Quagmire, the ten Moonshadows of Mephala, and... and Dawn's Beauty, the Princedom of Lorkhan... misnamed 'Tamriel' by deluded mortals. Yes, you understand now. Tamriel is just one more Daedric realm of Oblivion, long since lost to its Prince when he was betrayed by those that served him. Lord Dagon cannot invade Tamriel, his birthright! He comes to liberate the Occupied Lands! Ask yourself! How is it that mighty gods die, yet the Daedra stand incorruptible? How is it that the Daedra forthrightly proclaim themselves to man, while the gods cower behind statues and the faithless words of traitor-priests? It is simple... they are not gods at all. The truth has been in front of you since you first were born: the Daedra are the true gods of this universe. Julianos, Dibella and Stendarr are all Lorkhan's betrayers, posing as divinities in a principality that has lost its guiding light. What are Scholarship, Love and Mercy when compared to Fate, Night and Destruction? The gods you worship are trifling shadows of First Causes. They have tricked you for Ages. Why do you think your world has always been contested ground, the arena of powers and immortals? It is Tamriel, the realm of Change, brother to Madness, sister to Deceit. Your false gods could not entirely rewrite history. Thus you remember tales of Lorkhan, vilified, a dead trickster, whose heart came to Tamriel. But if a god can die, how does his heart survive? He is daedroth! TAMRIEL AE DAEDROTH! "This Heart is the heart of the world, for one was made to satisfy the other." You all remember this. It is in every legend. Daedra cannot die, so your so-called gods cannot erase him from your minds completely. Well done, champion! Your progress is swift and sure. Perhaps you will reach me after all. You think I mock you? Not at all. In your coming, I hear the footsteps of Fate. You are the last defender of decadent Tamriel. I am the midwife of the Mythic Dawn, Tamriel Reborn. I welcome you, if you truly are the agent of Fate. I tire of the self-styled heroes who set themselves in my path, only to prove unworthy in the event. I have waited a long time for you, Champion of Old Tamriel. You are the last gasp of a dying age. You breathe the stale air of false hope. How little you understand! You cannot stop Lord Dagon. The walls between our worlds are crumbling. The Mythic Dawn grows nearer with every rift in the firmament. Soon, very soon, the lines now blurred will be erased. Tamriel and Oblivion rejoined! The Mythic Age reborn! Lord Dagon shall walk Tamriel again. The world shall be remade. The new age shall rise from the ashes of the old. My vision shall be realized. Weakness will be purged from the world, and mortal and immortal alike purified in the refiner's fire. My long duel with the Septims is over, and I have the mastery. The Emperor is dead. The Amulet of Kings is mine. And the last defender of the last ragged Septim stands before me, in the heart of my power. Let us see who at last has proved the stronger! If you speak to him at any time when he is giving his speech in Carac Agaialor, he says: "You came for the Amulet. Take it then!" and will proceed to attack you. The masters of the daedric realms as listed in Mankar's speech are incorrect in several cases. Coldharbour is the realm of Molag Bal (The Doors of Oblivion), Quagmire is Vaermina's realm (The Doors of Oblivion), and Moonshadow belongs to Azura (The Book of Daedra). The Monomyth attributes the creation of Mundus to Lorkhan and the Aedra, describing how Lorkhan tricked the Aedra into making the world. In his speech Mankar Camoran holds that this is a lie purveyed by Tamriel's clergy. According to Mankar the Aedra are usurpers who rebelled against Lorkhan. The most controversial of Mankar's statements is that Nirn is nothing but another realm in Oblivion (though he refers only to Tamriel in his speech, instead of Nirn). This is mostly a matter of definition: as Mundus is surrounded by Oblivion it can be seen as part of it. On the other hand its history and Liminal barrier also set it apart from Oblivion. The Spells that Mankar can cast (all level-dependent) are: one Destruction spell, one Silence spell, one Disintegrate spell, one Summon Daedra spell, one Reflect Spell spell, one Spell Absorption spell, and two Restoration spells. In addition, his staff has Disintegrate Armor and Shock Damage enchantments. Attempting to sit on Mankar's throne will paralyze you for 3 seconds. It is impossible to actually sit on the throne. Mankar Camoran is voiced by Terence Stamp. Mankar Camoran erroneously associates some Oblivion Realms with the wrong Princes. 'Coldharbour' is Molag Bal's domain while Meridia's is 'The Colored Rooms', 'Quagmire' belongs to Vaermina while Peryite reigns over 'The Pits' and 'Moonshadow' is the realm of Azura while Mephala is sovereign of the 'Spiral Skein'. Mankar will speak in a normal Elf voice if you steal from him during the Dagon Shrine quest. This page was last modified on 23 December 2018, at 16:12.